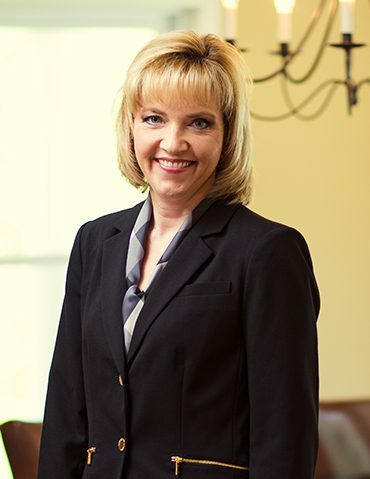 As a law firm focused on personal injury law, the team at Rinehardt Law Firm is committed not only to helping injured victims in need, but also to those living in the communities we serve. Our attorneys and staff are volunteers and donors for various non-profit organizations and charities. We regularly participate in events that raise funds or awareness about important issues related to our communities with a focus on safety. Our goal as Central Ohio personal injury lawyers is to make a difference to our clients and our community in big ways and small. We are dedicated to giving back to the communities we call home by giving our time and our financial support. 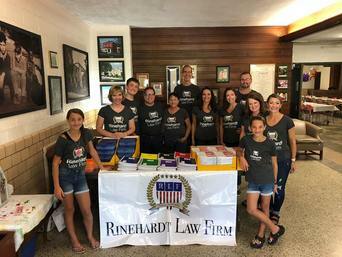 The Rinehardt Law Firm, in coordination with Mid-Ohio Youth Mentoring, sponsors a Back-to-School Bash each year in July for the children of Richland County. Our firm’s goal is not only to provide these children a backpack full of school supplies but also to provide them with an afternoon of food, fun, and laughs. Children enjoy bounce houses, craft making, face painting, an ice cream bar, and more. In the spirit of giving, we also help the children make gifts to give to their teachers on the first day of school. Each May, The Rinehardt Law Firm sponsors Motorcycle Safety Awareness Month. Throughout the month, we post safety blogs regarding motorcycle safety. We also give away safety glasses, “watch out for motorcycle” bumper stickers, and motorcycle safety yard signs during the entire month to whomever stops by the office. 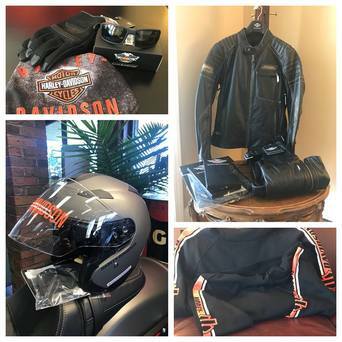 The month concludes with a giveaway consisting of over $1,500 in motorcycle safety gear, with the top prize being a Harley Davidson leather coat. People from all over Ohio enter their names for a chance to win some of this safety gear and then watch the giveaway live on social media. 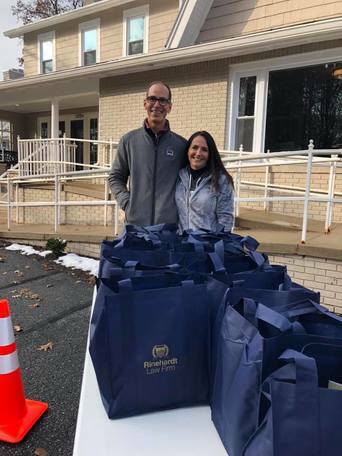 In 2018, Rinehardt Law Firm increased its efforts to educate the community about child seat safety. We posted safety blogs on our webpage and on our Facebook page, and we asked community members who needed a child car seat to enter to win a Graco 4Ever 4-in-1 Convertible Car Seat. 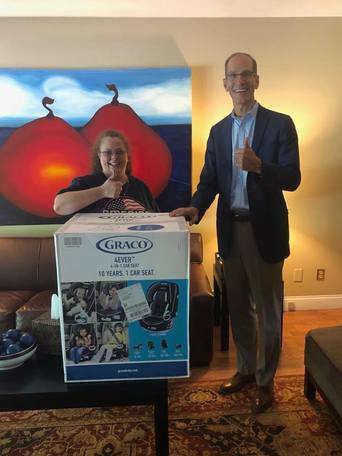 The lucky winner was a grandmother who babysits her grandchild. We look forward to continuing this event in coming years. Attorney John Rinehardt has teamed up with the Richland County Humane Society. This wonderful organization’s mission is to advocate and care for the abandoned, abused, and neglected animals in our community and to find them loving homes. 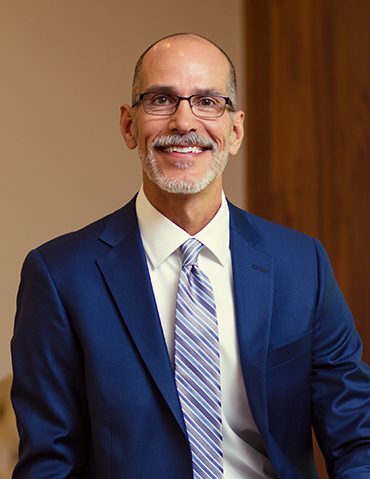 Attorney John Rinehardt has taken a position on the Board of the Richland County Humane Society and works to help them meet their goals. In August of each year, the Humane Society hosts a large event entitled, “Strutt Your Mutt”, which helps brings awareness to neglected animals while raising funds for the organization. The Rinehardt Law Firm is a proud sponsor of this event. 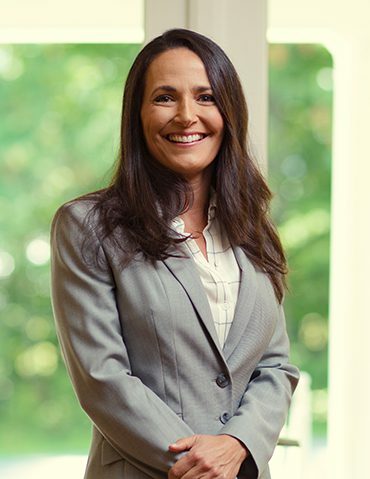 Attorney Melanie Fahey sits on the Board of Trustees as President-Elect of Community Action for Capable Youth (“CACY”). CACY is a Richland County Organization working to prevent and reduce the use of alcohol, tobacco, and other drugs and to move Richland county towards being a drug-free community. CACY continues to follow its tradition of providing drug-related education in local schools, but it also has expanded to include programming on bullying prevention, gambling prevention, and suicide prevention, just to name a few. It also provides counseling to at-risk youth and holds events such as a conference to inspire young girls, multiple parenting programs, health fairs, and more. We consider this an important endeavor in this community and are proud to participate in helping CACY achieve its goals. The Mock Trial program provides students the opportunity to learn first-hand about the law, court procedures, and the judicial system while building critical learning skills. We are happy to say that the attorneys at the Rinehardt Law Firm work with the mock trial team at Lexington High School to prepare them for their “case.” We are firm believers in the importance of teaching the younger generation about the law and of mentoring those interested in a possible future legal career. 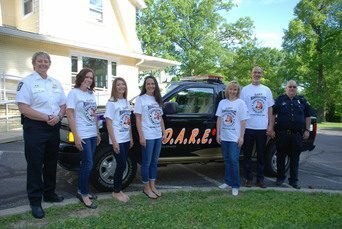 As part of our commitment to see Richland County become a safer and drug-free community, Rinehardt Law Firm is a sponsor of the DARE Program. We provide hundreds of t-shirts each year to the young graduates of this program. This well-established organization serves students from kindergarten through high school, teaching not only about the dangers of drugs but also about how to avoid peer pressure, gangs, and violence. 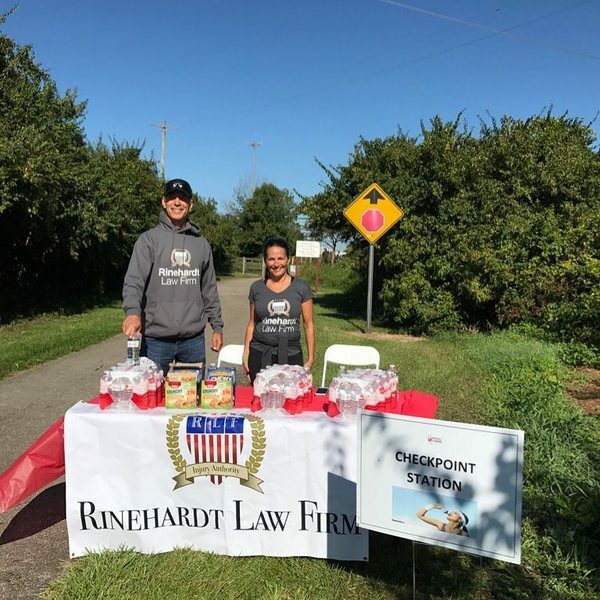 Rinehardt Law Firm is a proud sponsor of the Central Ohio “Walk Like MADD” event. MADD was founded in 1980 and is the nation’s largest nonprofit working to end drunk driving. It is estimated that MADD has helped to save nearly 380,000 lives. We are dedicated to helping MADD achieve its goal of making the roads safer for the community.